Growing up fennel, or finocchio as we called it, was served after dinner to aid digestion before dessert. It was served raw and tasted strongly of licorice. Though I love eating it raw, I also enjoy it grilled and sauteed. Honestly, in my opinion, you can't go wrong with fennel. The sweet unique taste of the fennel bulb adds so much flavor no matter how you use it. Bring a large pot of water to a boil, and cook fennel for 10 minutes. Remove and set aside to cool. Slice the bulb into quarters and season with salt and pepper. Grill fennel for 10 minutes each side, or until the pieces begin to soften, but still has a slight crunch. In the meantime fry pancetta on the stove until crispy, set aside to cool. Add olive oil, red wine vinegar, garlic powder and chopped sage to a small bowl and whisk to emulsify the oil. Season with salt and pepper. 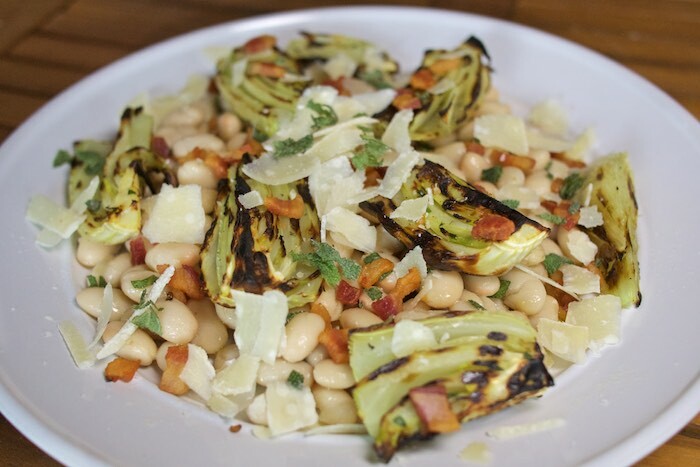 Combine fennel with the drained beans and fried pancetta. Toss with dressing, top with Parmesan cheese and serve. love bean salads and now I have to try grillingen fennelseeds. Love the use of grilled fennel in this salad... I can almost taste it from here!